Men are weird, but women have their moments. Men have fun. And now women can have as much fun as men have (with peeing standing up); they can write their name in the snow, rinse the sides of the bowl/urinal, etc. plenty of urine soaked hands will be the result of that little game, I'm sure. too much splashback! 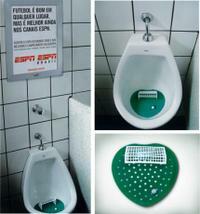 It looks like a lot of fun I wish they had some in the urinals near me. It actually reminds me of the "OFFICER TOM" urinal spashguards Purple Shirt of Best Show infamy installed at the Metropolitan Pavilion a coupla Record Fairs back. as drinking belongs to football almost like the ball itself, I consider this urinal very inspired solution for a unavoidable consequence of drinking. etb--I think she's referencing the old "extra e is for extra peee" ad. www.uro-goal.com - great site for more pictures !! Houses are not very cheap and not everybody can buy it. However, home loans was created to aid people in such kind of situations. Wow, your blog is really great!